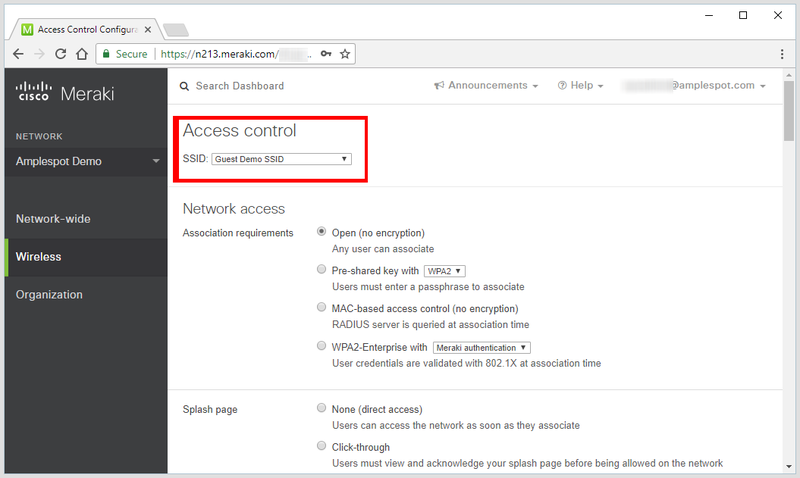 This guide shows how to configure the Cisco Meraki wireless environment to work with Amplespot. We use RADIUS accounting protocol to receive information about your WiFi client's movements throughout your venues. This information is then used to generate a variety of analytics reports. 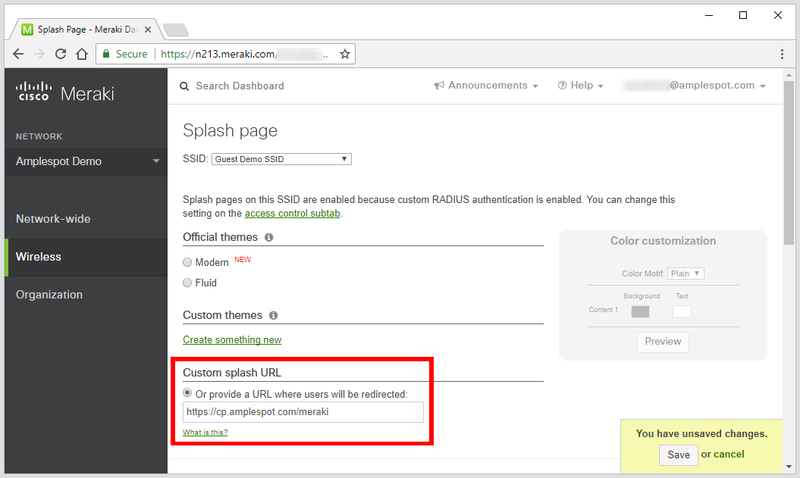 Cisco Meraki allows only IP addresses and not DNS names as a host configuration option for RADIUS for the splash page. While you can still use the IP addresses we recommend using the names as this is a safer option. 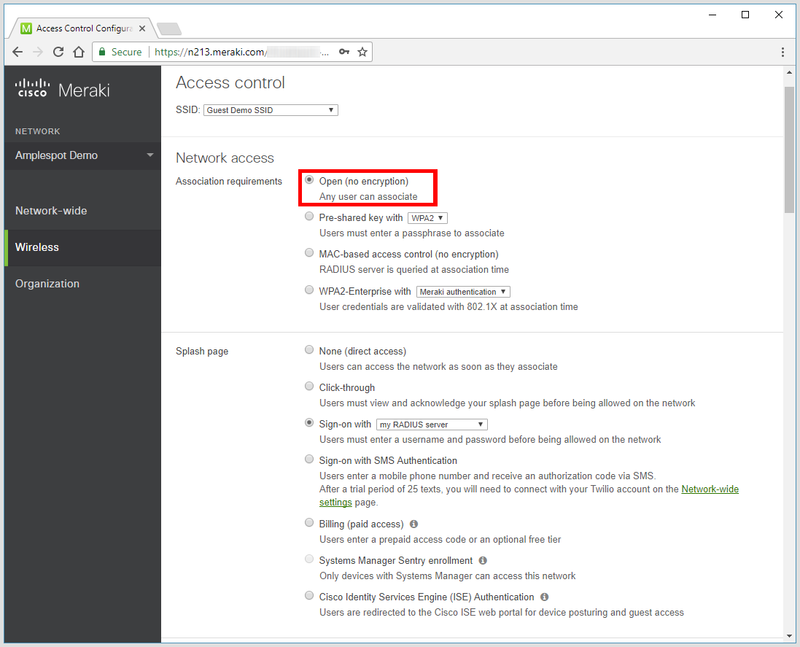 Open a ticket or give a ring to Meraki support and ask to enable hostnames as the configuration option for external RADIUS servers. 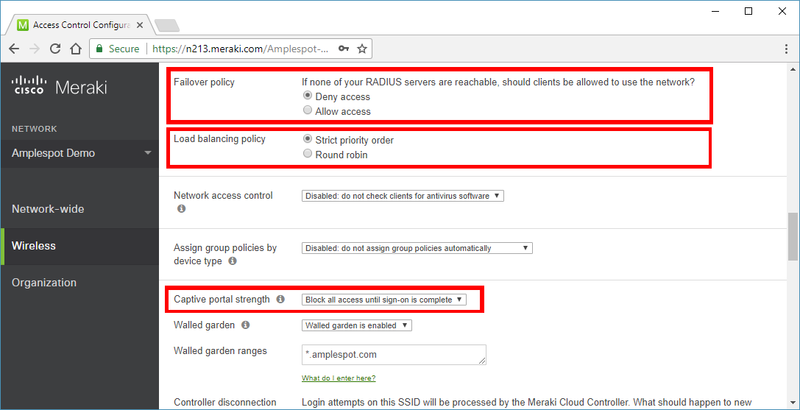 You will stop getting the error when trying to add DNS name of the RADIUS server as soon as Meraki support fulfils your request. In the drop-down select the SSID you would like to use with Amplespot. You will be able to repeat this process with other SSIDs you may want to use. Under the Network access, select the Open (no encryption) option. Under the Splash page, select the option Sign-on with. In the drop-down menu, select my RADIUS server. Scroll down to RADIUS accounting. In the drop-down select RADIUS accounting is enabled. Insert the same configuration as for RADIUS for the Splash page. Scroll further down and look for Failover Policy. Set option "If none of your RADIUS servers is reachable, should clients be allowed to use the network?" to Deny access. Scroll further down to Captive portal strength. Set it to Block all access until sign-on is complete. Scroll further down and look for Walled Garden. Make sure Walled garden is enabled and add the Walled Garden entries to the Walled garden ranges. (1) Relevant domain names depending on Social Login Options you would like to select in Amplespot Captive Portal(s). (2) Any website addresses you would like your WiFi Users to be able to access before they completed logging in to your guest WiFi. (2) Any domain names you might be using to serve external content, CSS styles or fonts for your splash pages. You can find the most up to date list of Walled Gardens here. Click Save at the bottom right yellow pop up to ensure all your changes have been made. 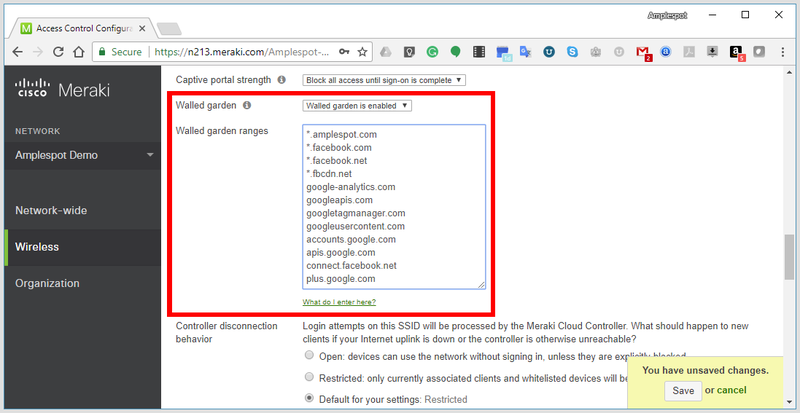 We now need to add the MAC addresses of your Meraki access points to you Amplespot account. To do this, click on the Wireless tab on the left-hand menu and select Access Points. 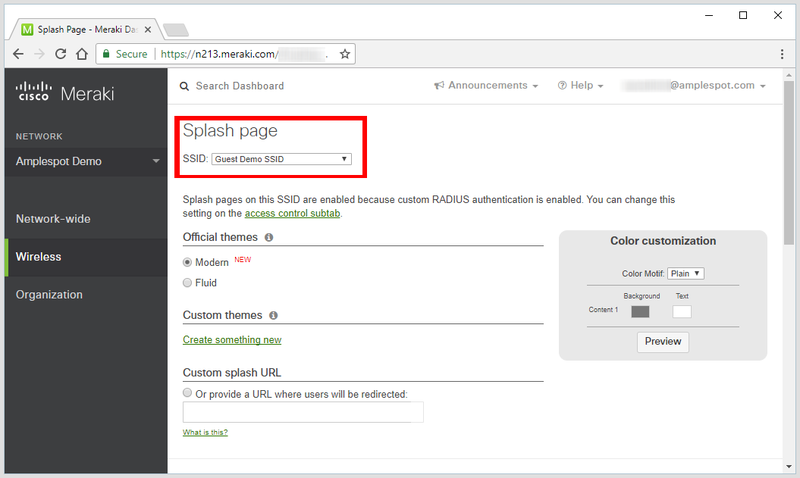 Make sure that the name of the SSID used by the Captive Portal Zone you are selecting exactly corresponds to the name of the SSID in your Meraki Dashboard. The name of SSID shall be inserted URL Encoded. For example, spaces shall be replaced with %20, full stop characters (,) - with %2E. 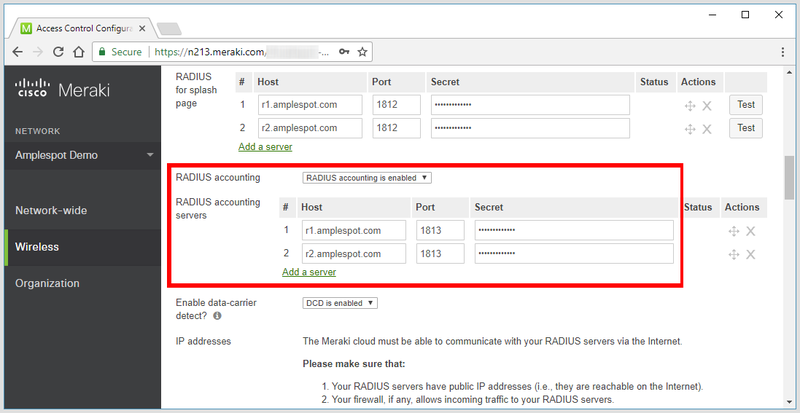 Meraki RADIUS Accounting does not provide accurate information about client devices roaming between the Access Points. 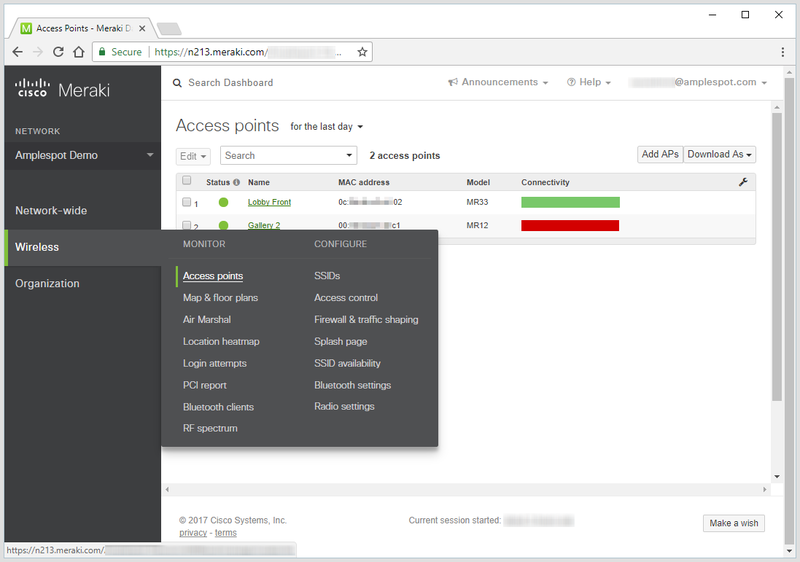 The inter- Access Point roaming information is required in order for Amplespot for analytics and engagement tools to work correctly. 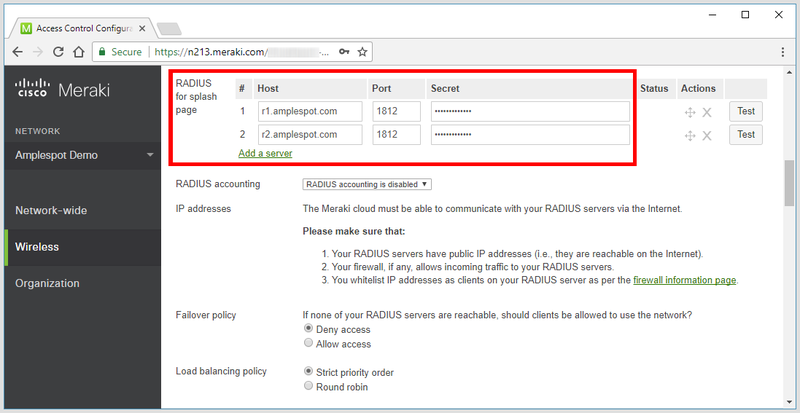 Meraki supplements the luck of RADIUS Accounting information with its Location Analytics API which has to be configured to send data to Amplespot in order for the entire integration to work correctly. Scroll down to Location and Scanning, in the drop-down set Analytics to Analytics enabled and Scanning API to Scanning API enabled. 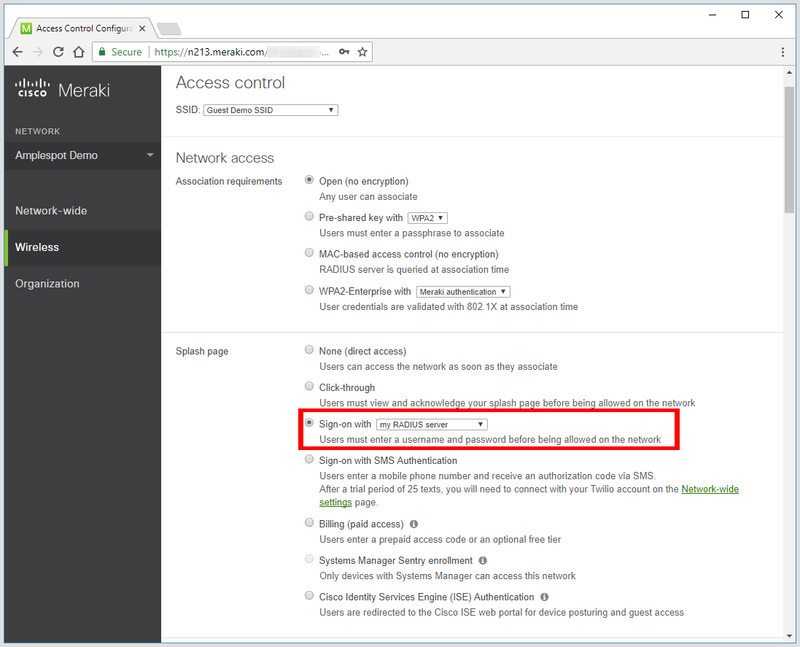 Enter your Meraki network name and paste the Validator ID you copied from Meraki dashboard earlier into the validator field. Click Validate to check test your configuration. You shall see the following message in the yellow box above the Post URLs configuration section. Now Click Save at the right-bottom corner of the page to save your changes. Connect to your Meraki WiFi network to initial Location API call to Amplespot API. Wait for 3 minutes and go back to Amplespot Admin Portal to check if your Integration is working. You have now successfully completed setting up the integration of Meraki Cloud Controller and Amplespot!